The fighting in Egypt and Palestine during the First World War is often overlooked. However, this year marks the centenary of the Palestine Tank Detachment, whose members fought and died in the Battles of Gaza. This is their story. During 1915 the main focus for British and Empire forces was on defending the Suez Canal from attack by the Ottoman Turks. During 1916 the British attacked and drove the Turks out of the Sinai, and in early 1917 they began planning to attack north into Turkish-ruled Palestine. 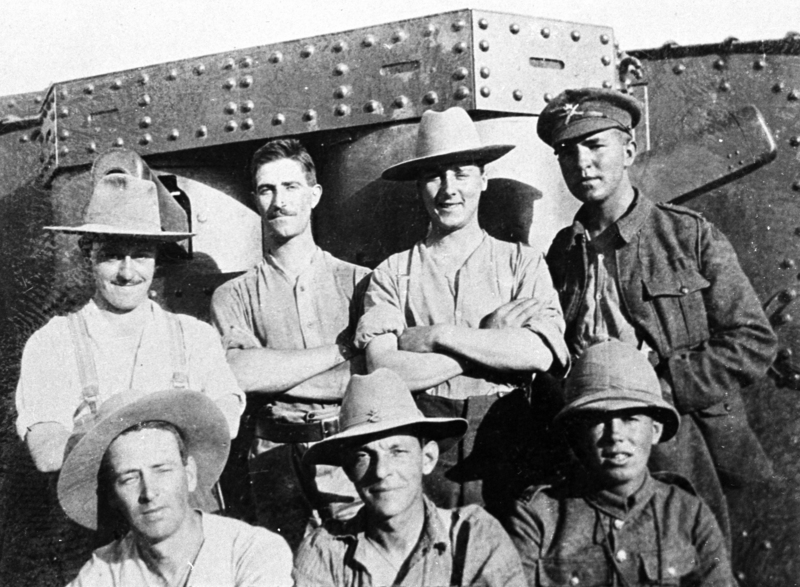 The first Tank Men assigned to the Egyptian Expeditionary Force arrived at Alexandria on the 9th January 1917. Most of them came from E Company, Heavy Branch Machine Gun Corps. Fifteen officers, 123 men and 8 Mark I tanks arrived on the 9th. E Company, later renamed the Palestine Tank Detachment, lost 7 of its members during the war. It saw combat on two occasions, at the Second (17th – 19th April) and Third (1st – 2nd November) Battles of Gaza. At the Second Battle 2 men died, 8 were captured (1 of whom later died) and 12 were wounded. At the Third Battle 1 man was killed and 1 wounded. The two men killed during the Second Battle were Gunners 206180 Robert Ferguson and 206177 Maurice Jones. Both were aboard the tank named Sir Archibald. This tank was immobilised by a Turkish shell then set on fire by further hits. Robert died on the 17th and 21 year old Maurice the next day after being evacuated for medical treatment. Three of their crewmates were wounded. It is believed the 8 men taken prisoner were the crew of the tank called Nutty. They had supported the infantry in capturing their objective, but one of the tracks broke, the tank was hit and caught fire and the crew were forced to abandon it. After heavy fighting the Turks recaptured the position, taking a number of prisoners. Nutty’s commander, Second Lieutenant Frank Carr, was badly burned. Despite medical treatment from Turkish and German doctors, he died on the 19th, aged 35. We know one man died from his wounds after the battle. Sergeant 40236 William Moulding, a former Royal Fusilier who had transferred to the tanks, died on the 27th April in Alexandria. The man killed during the Third Battle of Gaza on the 2nd November was 27 year old Gunner 302030 John Boswell. His tank has not been identified. According to the Commonwealth War Graves Commission, three more members of the Palestine Tank Detachment died during the war. 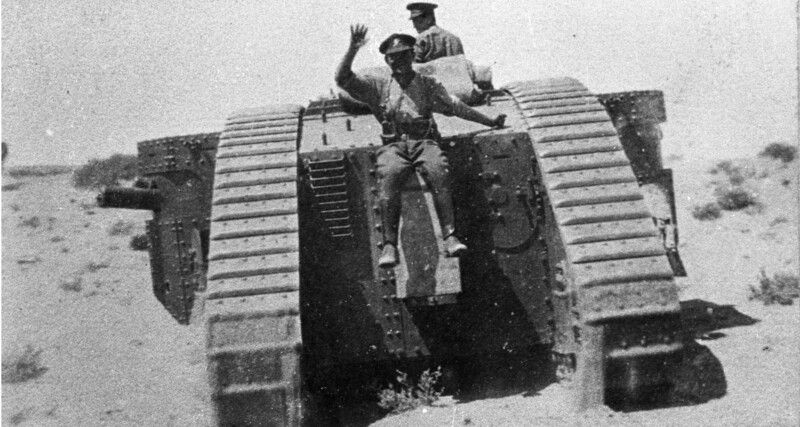 The detachment remained in Palestine until around July 1918 when the men, but not their tanks, returned to the UK. The 7 comrades they left behind are buried across Gaza and Egypt. Ferguson and Boswell are buried in Gaza War Cemetery. Colbourne, Baker, Iron and Jones also lie in Gaza, at Deir el Belah War Cemetery. Moulding is buried in Alexandria (Hadra) War Memorial Cemetery in Egypt. Frank Carr has no known grave, his name is recorded on the Jerusalem Memorial. Find out more about Tanks in Palestine with a post on the types of tanks that went out and what they did in action. Find out more about First World War tank men here or in The Tank Museum’s Tank Men exhibition. I never heard of this battle until now, but still interesting to learn about. My Father was an ex Royal Tank Corps member, joining in May 1938. Trained at Bovington, and served in Egypt, 1941 – 1944 (Royal Armoured Corps). He served after the war in the RAOC, retiring in 1960. I can remember many stories he told me about his life during WW2, enough to possibly write a book about. Does a complete list of the men of the tank detachment exist? 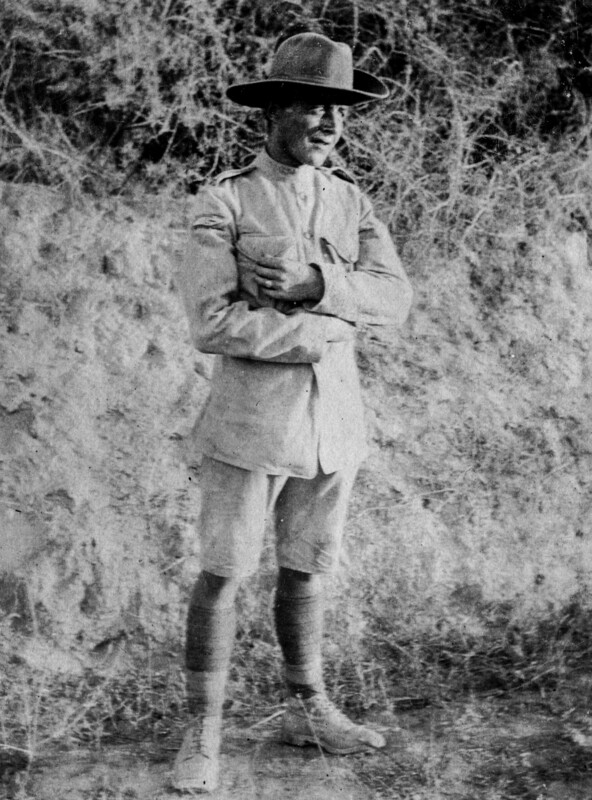 Egypt in December 1916 (Appendix VI) published in 1919, to join the army in Palestine along with 22 officers and 226 N.C.O.s and men. Their first action was the 2nd battle of Gaza. One tank ( Sir Archibald )was destroyed by a direct hit on 19th of April around 10 o’clock a.m. , one disabled by a shell that destroyed a track. Artillery Regiment No 4 ). It was a direct hit. The battery was sited at Nebi Muntar ridge. only two tiny batteries 1/4 and 2/6 with 8 modern Skoda 100mm M10 mountain howitzers sent to Palestine in spring 1916. My great uncle served with 2/6. Türkei”, Truszkowski becoming it’s CO. Both batteries always fought well and left their footprints in the Palestine campaign. The destruction of Sir Archibald really is a single event during the Palestine campaign and of the Great War itself. destroyed by an Austrian unit during World War One. Let us commemorate those brave men and above all, those of them that lost their lives during this event. Peter Jung’s book “The k.u.k. War in the Desert” shows a photography from the Austrian War Archives ( Kriegsarchiv) showing a destroyed female tank. was hit, and that Nutty, a female tank, got a broken track due to an artillery shell. Since the nick-names of those tanks and their gender are known, it is unlikely, that this great book shows the right tank. The fate of the crew of Sir Archibald shows, that this must have been due to a direct hit. destroyed by a direct hit. Maurice Jones 206177 was my Great Uncle. I knew very little about the battle. So thank you for this article, it’s filled in lots of gaps for me.